See the newsletter for full details. Kent Jones of Resource Contractors LLC told us about the kinds of red alder trees that he purchases to be sliced. They must have a 13 inches minimum diameter at the small end and be very clear of knots. If you have trees that meet this criteria, he is paying a very good price. The biggest problem is that most small land owners harvest in the summer, and he does not buy alder when the weather gets hot because of its rapid deterioration. He also buys Douglas-fir and western red cedar poles for Oeser Company in Bellingham. If you would like to listen to his presentation, you can do so here. On February 19, members enjoyed a fried chicken dinner at the Oakview Grange and re-elected Ricky Kuykendall and Chuck Higgins to Board positions. 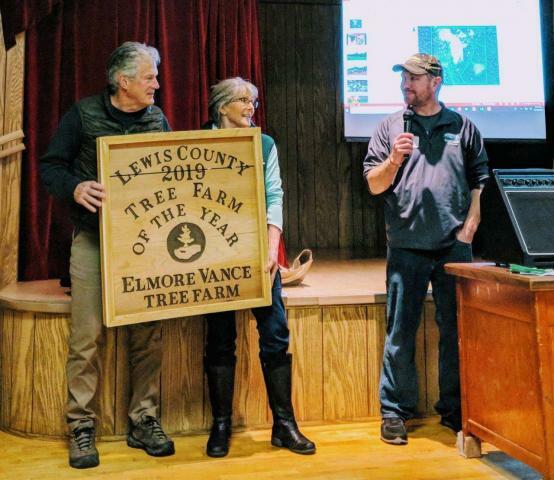 The 2019 Lewis County Tree Farmer of the Year Award was presented to the Elmore Vance Tree Farm. Micheal Sprouffske of Class 39 of the Washington Agriculture and Forestry Leadership Program spoke on their international trip to Greece & Italy. At our annual awards banquet, 3 family forest owners were recognized for their good forest practices through multiple generations. Those recognized were: Shirley Heitzmann, Elmer and Nancy Laulainen for Forest Stewardship; Bill and Mike Merriman for Forest Management, and Chris and Melanie Clowe for Commercial Thinning. Each received a large cedar sign that they can proudly display. Attendees had the opportunity to purchase raffle tickets for items donated by local businesses and members, including 2 chain saws. Richard Pine was the winner of the chain saw donated by RSG, and John Henrikson won the chain saw donated by Service Saw. October 2018 Meeting: Who will buy my oversized logs? Rich Nelson of Millwood Timber, Inc. described an interesting market for the oversized, ugly logs that no one else wants. His company puts them into containers in Tumwater and ships them to China, where they are transported by truck considerable distances to the interior of the country to be made into coffins. Chinese people who live in cities must be cremated, but those who live on their land in the country can still be buried in family plots on their own land. They like to have single boards for each section of the coffin, so they like our oversized logs. Defect isn’t critical because they can putty over it and paint the coffin. If you missed the presentation and would like to hear it and see some of his photos, you can view it here. Jeremy Martin hosted us at the Centralia mill. We looked at logs rolled out for scaling, then toured the mill. Jeremy brought out several valuable points about marketing alder: 1) Landowners may be losing money by sending sawlog quality alder for pulp. 2) Alder trees often have sweep that the logger may be inclined to cut out, sending shorter logs to the mill. It often is better to send longer logs and let the scaler deduct for defect. 3) Processor operators who are accustomed to processing Douglas-fir need to reduce the gripping pressure of their equipment when processing alder. The external damage of the teeth on the log can be cut away, but on alder, often the damage goes deeper and may not be visible until the wood is kiln dried or even stained. In case you missed the tour, or didn't get the handouts, here is the material that Andrew Bluhm shared about the results of the alder spacing and thinning trials that have been going on throughout western Washington for the last 28 years. Handout. Attendees viewed 3 different stand treatments: 1) FSC approved clearcut; 2) thinning with root rot cut out; and 3) normal thinning. They also learned about the Jackson Prairie Gas Storage Facility which lies underneath the property, and saw a demonstration of a drone. A portion of the drone flight can be viewed here. At the Washington Tree Farm Program's 33rd Annual Awards Luncheon, held during the Washington Farm Forestry Association Annual Meeting on May 21, 2018. 2018 Lewis County Tree Farmer of the Year Michelle Blake Morgan competed with 2 other nominees for the title of Washington State Tree Farmer of the Year. Another tree farmer received the state award, but as part of the competition, a video of Michelle and her tree farm was prepared and is available for viewing here. In case you missed the April meeting, Connie Harrington's presentation Where Should I Plant Alder? is available online. In 28 minutes, Connie explained how soil characteristics, drainage, elevation and microclimate (frost) are important criteria in determining where alder will grow well, and directed us to tools that can be used to find that information for your property. 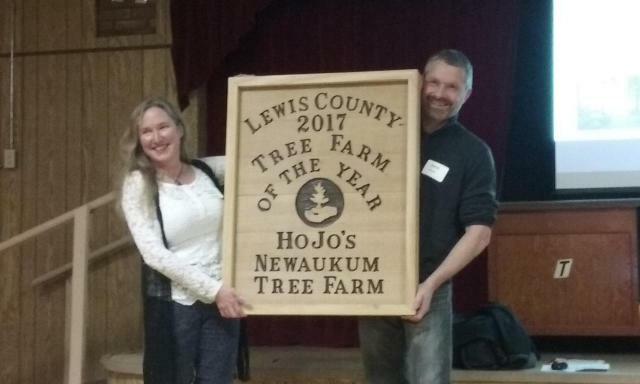 At the LCFFA Annual Meeting on February 20, Richard and Debra Pine, O'Neill Pine Company, were recognized as Lewis County Tree Farmers of the Year for 2018. Their presentation included a 7-minute drone overview of their properties which can be viewed on YouTube. Officers and Board Members were elected for 2018-2019. Devon Powell was elected President, Dave Roberts Vice-President, Luke Moerke Secretary, Norma Green Treasurer, Board Members are Ken Lentz, Rick Kuykendall, Chuck Higgins, and Russ Armitage. James & Jil Muller for Commercial Thinning. 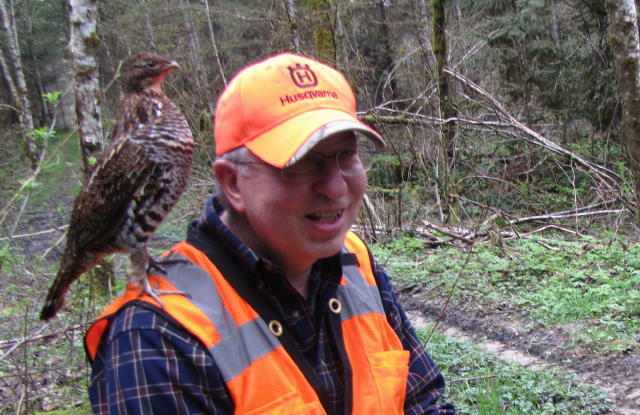 Steve Webster, retired WSU Forestry Extension Agent, past LCFFA secretary, president, and board member for life, was given the Distinguished Service Award postumously. He passed away in June 2017. The presentation that was given at the banquet can be viewed online. Micheal Hurley, the 2016 Lewis County Tree Farmer of the Year, competed with 2 other nominees for the 2017 Washington State Tree Farmer of the Year. Another nominee was named winner, but a video of Micheal Hurley's tree farm was made and can be viewed here. 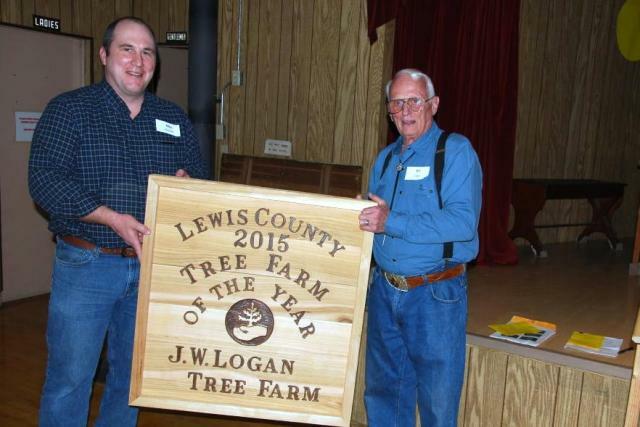 Bill Logan, the 2015 Lewis County Tree Farmer of the Year, was nominated for 2016 Washington State Tree Farmer of the Year. That title was given to another nominee, but a video of his tree farm was prepared and can be viewed here. 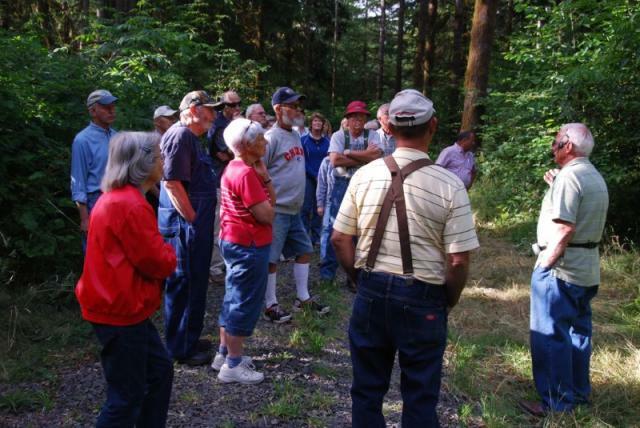 The Lewis County Farm Forestry Association meets on the 3rd Tuesday of each month, except December. Educational meetings are held in the Lewis County Courthouse basement conference room in January, March, April, May, and October at 7 p.m. Twilight tours are held in June, July, August and September at 6:30 p.m.
Two dinner meetings are held at other locations: the Awards Banquet in November and the Annual Meeting in February.